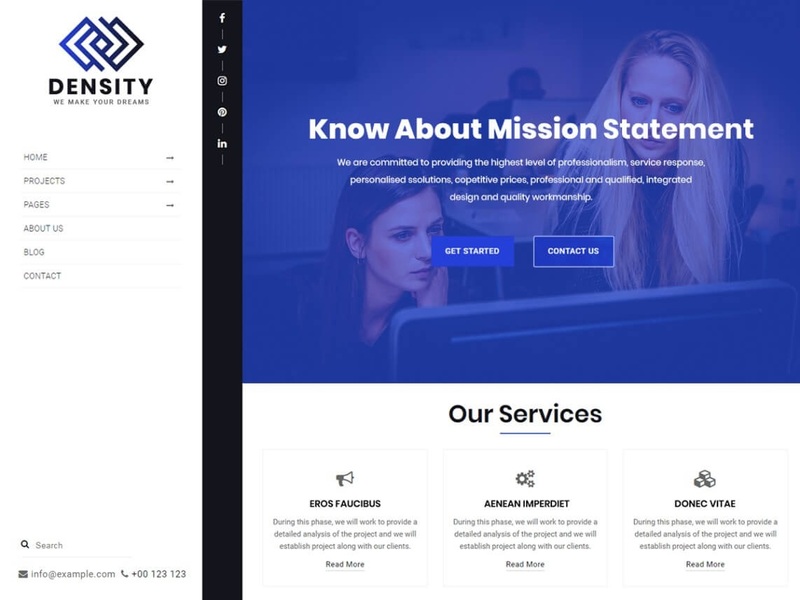 Density is a WordPress theme useful for startups business, company, corporate, a consultancy. Theme is also tested latest version of WordPress. Theme is Theme can be customize in an easy way. The theme is fully editable because this is built on WordPress customizer. Theme is useful for digital agency, corporate startups and any type of company. The theme is free for use so lets start to build beautiful website. Vertical menu is best feature of this theme . Theme have consists features like mobile Responsive. Theme is Gutenberg ready. Support is superior from our side. A theme is WooCommerce ready and Translation Ready which supports RTL ready. Google Fonts are awesome. Some of the many customizable aspects include Layouts / Header elements (Email Address, Contact Number), Featured images, Colors, Post meta, Widgets areas, Homepage elements, Slider, Latest Blog, About Block, services, Call To Action Socials and much more. It’s a multi-purpose & beautiful theme suitable for Digital Market / Digital Agency / Online Business / Affiliate Market / App Landing Page / Software Landing Page and for more. We use WordPress customizer for it. Theme have vertical menus these give a unique touch to the theme.